Mother Teresa has long been popularly known as the ‘Saint of Calcutta’ and on September 4 her sainthood will be officially recognised by the Church when Pope Francis canonises her in a ceremony at St Peter’s Basilica, a celebration that will be streamed live to a special gathering at St Mary’s Cathedral in Sydney. Mother Teresa, the foundress of the Missionaries of Charity, is universally known for her love and care of the poorest of the poor in India and around the world. And she was no stranger to Australia, having visited here 10 times, up to 1985, and established missions of her Sisters here from as early as 1969. Her Sisters in Australia are excited about the canonisation, but say it has always been just a matter of time. “It is a great joy. Everyone is very excited about it,” says Sr Maria Lucy MC, Regional Superior of the Missionaries of Charity, who is based at the regional headquarters in Sydney’s Surry Hills, and who knew Mother Teresa well. And the wait has not been long. 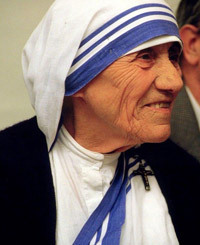 Mother Teresa, who was the recipient of more than 300 Church and civic honours and prizes in her lifetime, including the 1979 Nobel Peace Prize, died in 1997 and was beatified in 2003. Her canonisation will take place just 19 years after her death. Sr Maria Lucy says that Mother Teresa’s canonisation comes at a crucial time in light of recent world events and will act as a witness to the power of love across all divides. “It’s very interesting that God has chosen at this time to make Mother a witness to Christ’s love across boundaries,” she says. 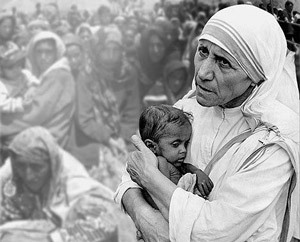 “Mother never made distinctions among people – whether it was Hindus, Muslims, non-Christians or Christians – she went to the poor regardless of religion, class or culture. The Missionaries of Charity have been in Australia since 1969 when Mother Teresa established a mission to Bourke in outback NSW. She had come to know of the needs of the Aboriginal people through a personal connection to Cardinal Knox of Melbourne, who had been Apostolic Nuncio to India, and she established the Bourke mission at the invitation of Bishop Warren of Wilcannia-Forbes. 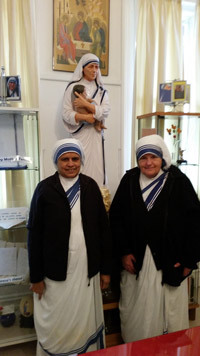 Today, Missionaries of Charity are found right around Australia, in Alice Springs, Brisbane, Dareton NSW, Darwin, Kalgoorlie, Katherine, Melbourne, Orange, Perth, Queanbeyan, Tennant Creek, Wagga Wagga and Sydney. The Australian region of the Missionaries of Charity also includes houses in New Zealand, East Timor and Indonesia. In Sydney, the Sisters’ ministry includes running a soup kitchen in Surry Hills, visiting older, lonely people living in high rise flats, taking Holy Communion to some older Catholics, teaching Scripture and heading into the city on Friday evenings to spend time with people sleeping out and provide them with a snack and a drink. Elsewhere around the country, apart from their work with Aboriginal people, they run shelters for women and men, visit the aged, sick and lonely, and provide outreach for the homeless. Sr Maria Lucy, says much of the Sisters’ work centres around visiting people who are experiencing “the poverty of loneliness”. Only two Sisters from the Australian Region will travel to Rome for the canonisation, with the other Sisters celebrating with the local people in their own places with a special Mass and prayers. At St Mary’s Cathedral, Archbishop Anthony Fisher OP will celebrate Mass at 6pm on Sunday, September 4, and following Mass, all are welcome to the Cathedral Hall to see the Canonisation Mass streamed live from Rome at 7.30pm. Dinner will be available and the Mustard Seed Bookshop will be selling resources related to Mother Teresa. From August 29 to September 12 there will also be a multi-media exhibition celebrating the life of Mother Teresa, held in the Cathedral Crypt. Auxiliary Bishop of Sydney, Bishop Terry Brady, says that in 1970, his parents gave him the book about Mother Teresa, ‘Something Beautiful for God’, by journalist Malcolm Muggeridge. Mother Teresa promised to refuse God nothing and serve the poorest of the poor. Bishop Terry says he hopes Mother Teresa’s canonisation will be a time of spiritual blessing. “May her canonisation, in these closing months of the Year of Mercy, continue to help us all realize we have a loving, merciful God,” he says. Sr Maria Lucy says that official recognition of Mother Teresa’s sainthood is a sign of her holiness. “The work was never just social work for her,” she says. “Mother went to the slums so that they would know Jesus and know how much Jesus loved them and cared about them. There was always a spiritual dimension about her work, to bring God into the lives of people. “Mother made the promise when she was still in Loreto (before leaving the Loreto nuns to establish the Missionaries of Charity), that she would refuse God nothing, and she really didn’t.